This exhibition presents selected works from the faculty and students at The University of Texas at Arlington (UTA). In August 2018, selected works from the faculty and students at Wenzhou-Kean University (WKU) will be presented at UTA. 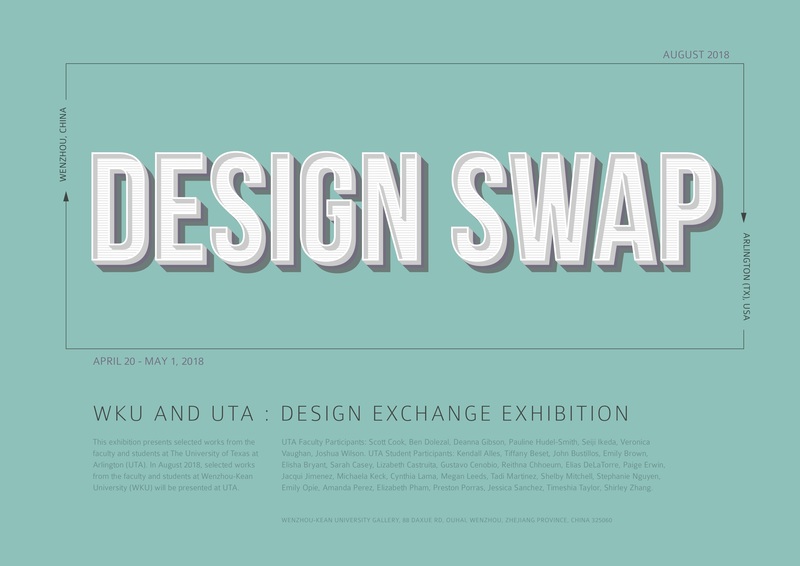 UTA Faculty Participants: Scott Cook, Ben Dolezal, Deanna Gibson, Pauline Hudel-Smith, Seiji Ikeda, Veronica Vaughan, Joshua Wilson. UTA Student Participants: Kendall Alles, Tiffany Beset, John Bustillos, Emily Brown, Elisha Bryant, Sarah Casey, Lizabeth Castruita, Gustavo Cenobio, Reithna Chhoeum, Elias DeLaTorre, Paige Erwin, Jacqui Jimenez, Michaela Keck, Cynthia Lama, Megan Leeds, Tadi Martinez, Shelby Mitchell, Stephanie Nguyen, Emily Opie, Amanda Perez, Elizabeth Pham, Preston Porras, Jessica Sanchez, Timeshia Taylor, Shirley Zhang.